Patented Raised AXYS® RMK® Chassis The AXYS® RMK® features a patented, raised chassis that increases clearance and reduces drag to keep you on top of the snow. 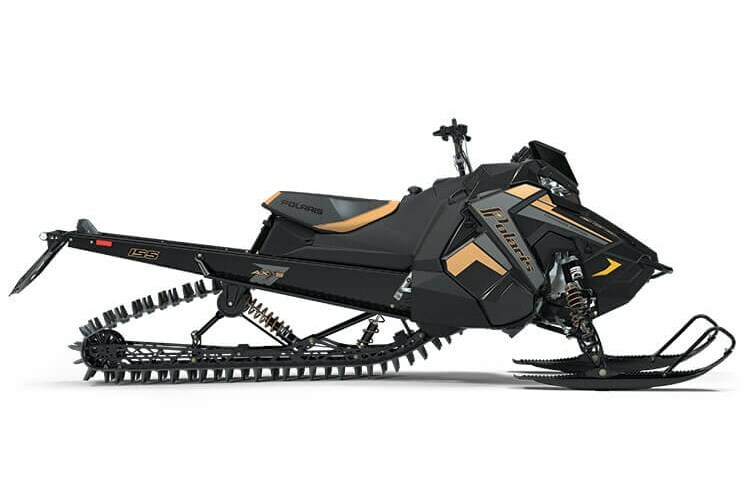 The AXYS RMK chassis, purpose built for mountain riding, allows for improved sidehilling, faster and easier climbing, and instantaneous lift allowing the sled to pop onto the snow faster. The aluminum overstructure is lightweight and durable for all types of riding. Taller spindles increases clearance to reduce drag. Rear Suspension The lightweight, rigid rear suspension design features revised geometry to control pitch. This improves weight transfer, delivering better control and a more compliant ride. The rigid suspension delivers power directly to the snow. Off-trail, riders will notice improved weight transfer while maintaining the approach angle. On-Trail, riders will notice a more compliant and comfortable ride. The rear suspension features a rail design that helps lift the rear skid while driving it forward. Track Options PRO-RMK riders have a choice between the Series 6 2.6" track and the Series 7 3.0" track. The Polaris® exclusive Series 6 2.6" track provides the ultimate all mountain performance. The new lightweight track is designed for improved deep snow and hard pack traction and better lift. The Polaris exclusive Series 7 3.0" Track is the ideal track to provide lift in the deepest, softest snow conditions. Features a lightweight single-ply design optimized for weight and powder snow performance. All 3" track models feature a gearing-optimized chaincase drive system as well as a unique snow flap designed to work with the 3" track. QuickDrive™ Low Inertia Drive System The QuickDrive™ Low Inertia System is designed to make the sled rev quicker for instantaneous lift and reduces rotational inertia by 21% for easier handling and flickability.Not simply a belt-drive, it is a complete lightweight drive system — featuring an extruded drive shaft, lightweight brake, RMK-specific brake caliper and of course the most visible piece of the system — a maintenance-free belt drive that requires no oil or tensioner system. The complete system reduces rotational inertia by 21% which means 5lb. less effort when carving. Walker Evans® Shocks PRO-RMKs come with premium Walker Evans® Piggyback Clicker Shocks or the Walker Evans® Monotube Shocks. The Walker Evans® Piggyback Clicker Shocks with compression adjusters and remote reservoirs offers the best performance across the broadest range of conditions. The Walker Evans® Monotube Impact-Extruded Shocks are the lightest weight shock option from Polaris for those riders counting ounces. The one-piece, simple design is lightweight yet durable. Legendary RMK Balance The patented AXYS® chassis delivers the RMK’s renowned perfect balance that riders have come to expect. The AXYS RMK offers increased, ultimate control and a more compliant ride. ALL-NEW AXYS® PRO-RMK® React Front Suspension ALL-NEW AXYS® PRO-RMK® React Front Suspension provides riders with the most precise and effortless ride in the deep snow. Effortlessly initiate sidehills and experience less fatigue with the most predictable ride.This new front suspension features: - An all-new geometry with an adjustable 36”-38” stance. - A sway bar designed for predictable handling. - All-new forged A-arms and forged spindles are optimized for strength and durability and designed specifically for the new React Front Suspension. 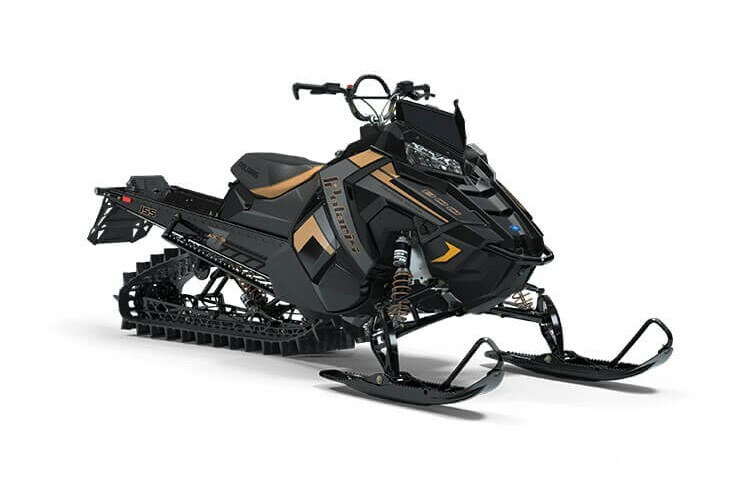 AXYS® Body Panel Design The AXYS® RMK® features a compact body panel geometry and design that helps give the sled the best lean angle in the industry allowing it to hold even the steepest sidehill lines. RMK does not "Panel Out" like other competitors. Lightweight Polaris snowmobiles are the lightest sleds on the mountain. Polaris®mountain sleds have always been light AND rigid with added strength & durability while reducing weight on the RMK® AXYS® platform. 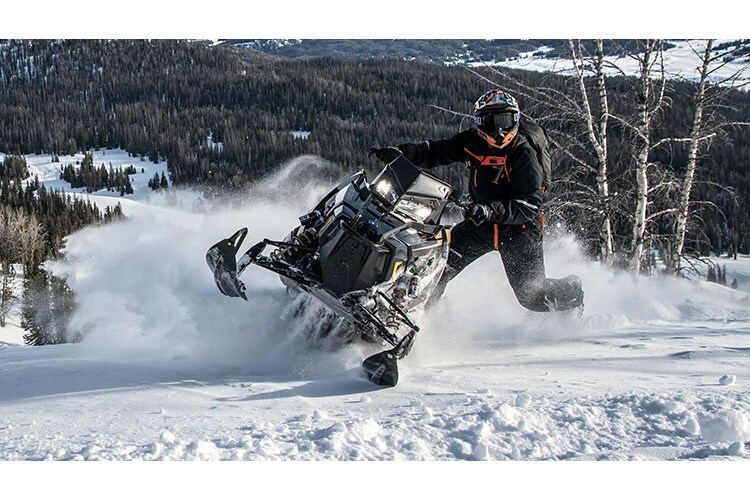 Polaris uses design optimization software to analyze the loads and stress points for various systems and components of the snowmobile which allows the team to design lightweight yet durable snowmobiles. 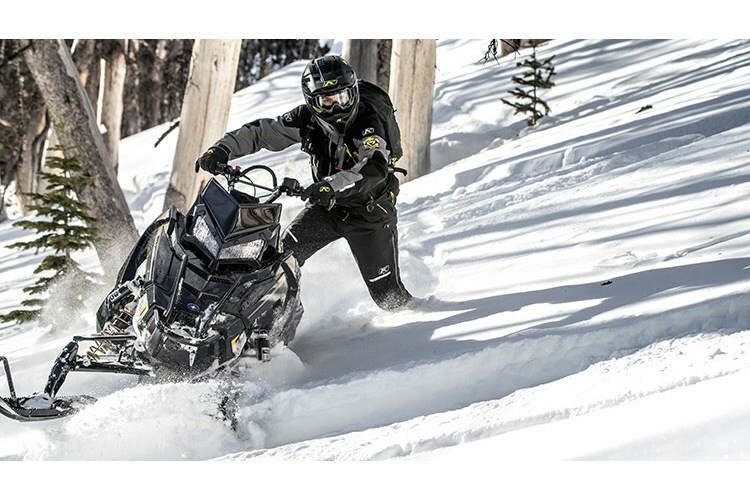 Providing riders with instantaneous lift, Polaris sleds help riders get up on top of the snow faster. PowderTrac™ Running Boards The PowderTrac™ running boards have been developed for maximum snow clean out and maximum strength. Built from extruded aluminum with bonded cast lugs, they boast an open area of over 50% and integrated traction that is machined in for sure footed performance. There is now additional open space at the back of the boards by the rear pad to reduce snow build up. Mountain Hoop Re-designed in 2016, the mountain hoop is more ergonomic and has been moved down 2.5" to prevent hitting the rider in the chest when in steeper terrain. Now a one-piece stylized design, the mountain hoop is made of a durable polyurethane material. Brakes These lightweight brakes feature a fixed 2 piston opposed caliper design for an improved and quicker braking response and feel. The brake pad material features higher thermal properties to provide more optimal wear over time. 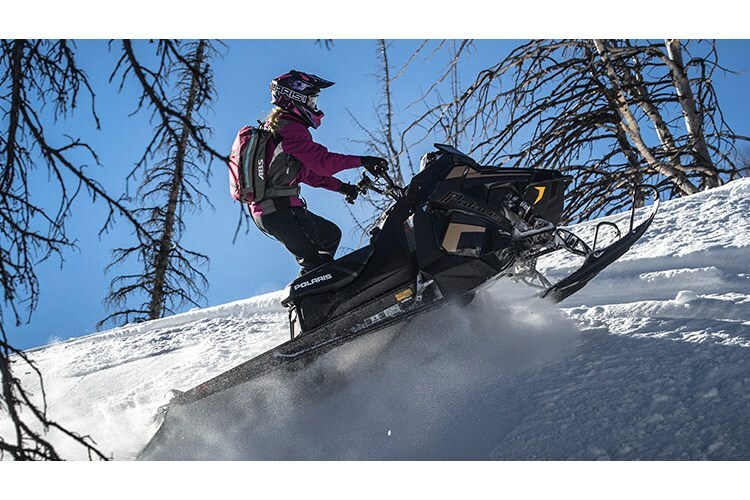 Integrated Storage Solutions Optional, accessory storage was designed and developed right along with the AXYS RMK® platform, so it installs securely and features seamless, integrated styling that matches the sled’s design lines. Polaris Engineered with the highest quality of materials.